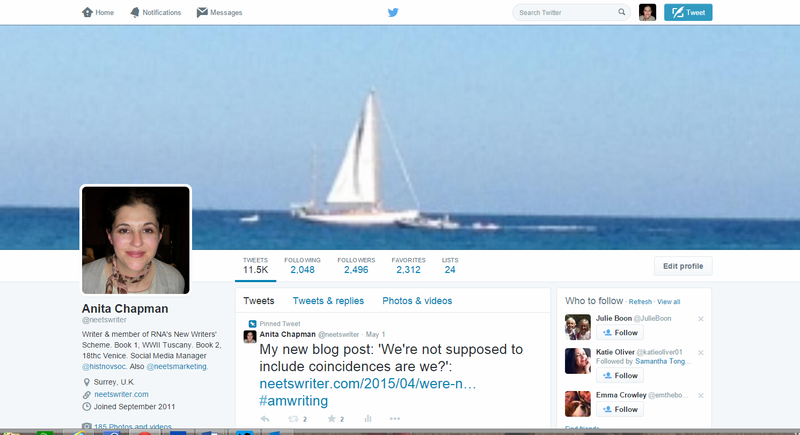 neetsmarketing : What Can Twitter Lists Do For You? What Can Twitter Lists Do For You? How do I use Twitter Lists, and what can they do for me? Twitter tells you how to set up lists here. When you first join Twitter and are only following a few people (who I'm going to refer to as 'users' from now on), it’s easy to keep up with your timeline. And a lot more fun really because you get to know everyone. But as your 'following' number grows, it’s easy to lose track of who everyone is. Some users you follow may tweet information which is more relevant to you. Some may tweet lots of promo, or over-retweet. It is possible to mute or unfollow in those cases, but if you're following a lot of users, this could be time-consuming. 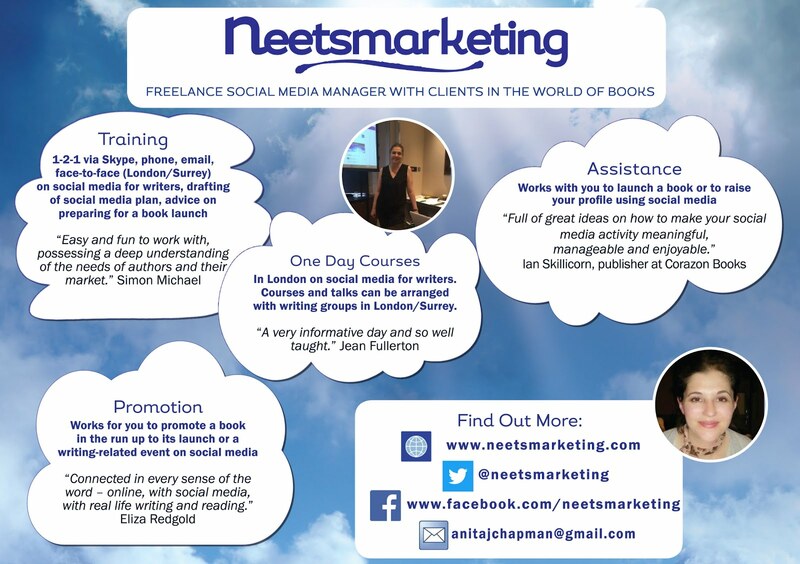 Some users may be ‘must-follows' because they always provide great content-perhaps about the publishing industry, the best blog posts on writing, writing competitions etc. 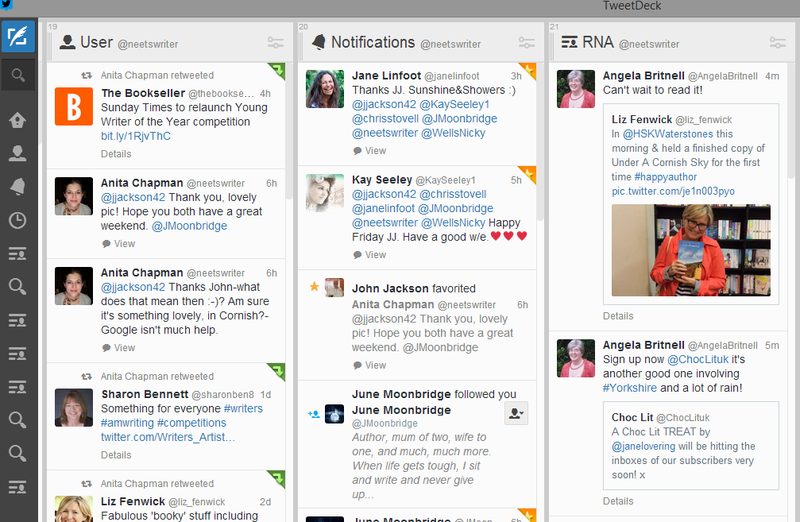 Lists can help you manage your time on Twitter more efficiently, and they work well with Tweetdeck (and Hootsuite. I'm a fan of Tweetdeck, so will use it in the below examples), because you can dedicate a column to the Lists you check most often. 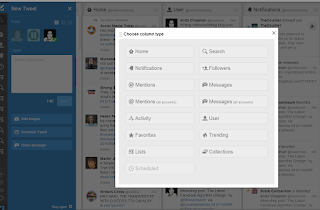 Columns can also be used for hashtags and other searches, but I'll talk about that another time. If you're following 5000+ users, it’s worth using Lists, because once you reach that magic number, you’re restricted on how many users you can follow. Find out more about this here. If a user has 50K followers and only follows 10, meaning they'll never follow you back; adding that user to a List is a way to limit your 'following' numbers. I.e. You don’t have to follow someone if you add them to a List. You may wish to do both, of course. Lists are a way of separating who you follow into groups, relevant to you. 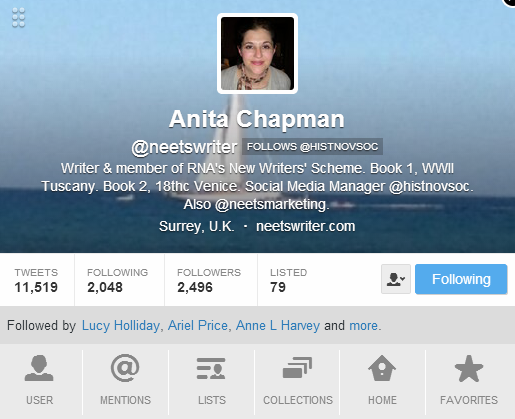 For my neetswriter profile, I have private Lists for Romantic Novelists’ Association (“RNA”) members, Writers, Historical Novel Society members-and then Lists for subjects relevant to my work in progress: Georgian, Art, Italy, Country Houses. I also have lists for book bloggers, agents, publishers, press; and more. 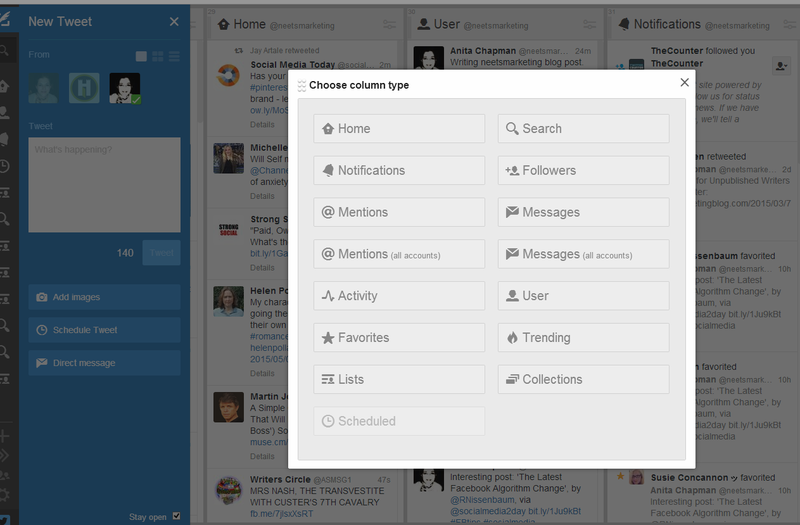 I have columns for most of these Lists in Tweetdeck and I can see the bulk of my timeline nicely organised into groups. Say I have ten minutes to spend on Twitter and I want to find new blog posts written by RNA members, I scan the RNA column and retweet links to the blog posts I like. I also retweet interesting Tweets from Georgian, Art, Italy and Country House Lists because many of my followers are interested in those subjects. I check Lists on my iPhone when I'm out, by pressing the wheel, then Lists. 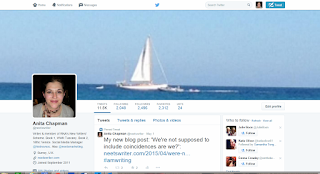 And Lists can be checked on Twitter.com by clicking on your profile photo in the top right hand corner. You can set up your own Lists-private or public (see how to do this in the link at the top of this post). Remember that when you add someone to a public list, they will get a notification, so if you place someone in a category they may not wish to be part of, they’ll be notified of this by Twitter. 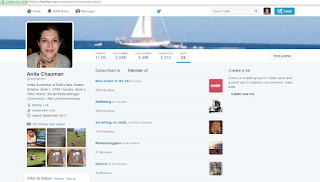 On Twitter.com, you and other users can see how many Lists you've set up, and/or are subscribed to in your profile. 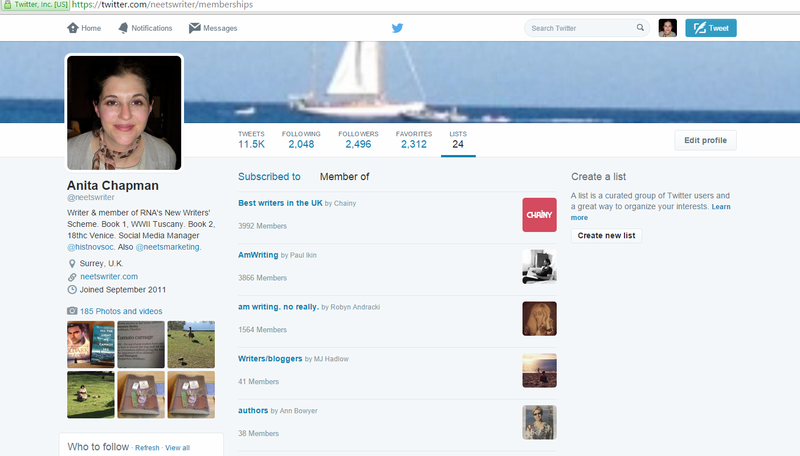 You can subscribe to lists set up by someone else, e.g. the RNA Members list set up by the RNA. Or, you can combine the above. When you add someone to a public List, don't forget they'll see how you have ‘categorised’ them! If you are added to a List, it’s worth looking through it (if you have time, it can take ages), to find new people to follow. So, if you aren’t using Lists already and you've been tearing your hair out trying to keep up with all those Tweets, it’s worth having a go. This is definitely a way to save time on Twitter, and all writers want to do that don’t they?-so they can get on with some #amwriting. 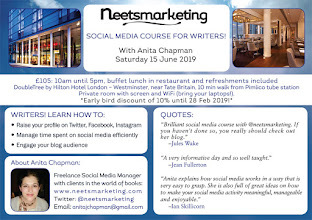 You can read all of my posts on Twitter here, including My Beginner's Guide to Twitter for Writers and 3 Ways to Retweet on Twitter. Very useful information, Anita - I've been added to people's lists but haven't set up any of my own! Thanks for your comment Rosemary. I expect you are on quite a few lists :-)! Yes, I've been using lists. It's a good way of keeping everything 'tidy'! Thanks for visiting Helen! Yes, it definitely helps to use Lists, especially if you're following a large number of people. That's an excellent post. I find Lists are essential - especially for separating business and pleasure. I also use them for temporarily following a topic - news, current affairs etc. This is really useful. Thank you! I'd never really got to grips with lists before and this really helps. I'm so glad it's helpful Rhoda! Thanks for reading, and for your comment :-). 26 Feb 2016: Linda Chamberlain on Finding Readers! 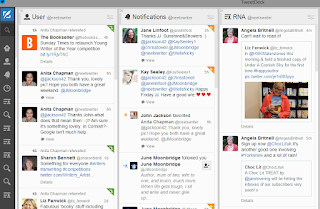 6 Feb 2015: My guest post on the Romantic Novelists' Association Blog: 'Getting to Know the RNA Through Social Media'. 19 Tips on How to be the Ideal Blog Guest! What are Hashtags, Why Use Them, and How? 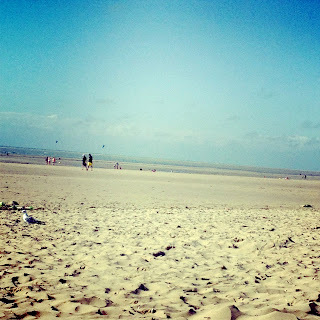 Are You Taking Social Media Breaks? Is it worth paying to promote a Facebook Page? Linda Chamberlain on Finding Readers! New Romantics Press on Marketing Books! LinkedIn Premium Benefits: Are They Worth the Investment? 60+ May Social Media Ideas – Videos, GIFs and more! Who sets the beat in the electronic music industry? Goodbye, Postagon: I have loved your white spaces!